Will you discover the fabled Northwest Passage in time to return? Our library has a disproportionate number of books on mountain climbing and Arctic and Antarctic exploration of the Victorian era (my partner’s greatest ‘historical crush’ is George Mallory), so when I spotted this game I really couldn’t resist. It did after all promise the possibility that I could induce her to play it with me. This lovely production does drip theme, representing as it does the late 19th century expeditions to discover not only the fabled Northwest Passage through the Canadian Arctic, but traces of the lost 1845 expedition led by Sir John Franklin. Underneath the theme is a relatively standard tile-laying game with an unfortunately heavy emphasis on point-scoring, though the addition of a ‘solar disc’ piece that moves around the board and indicates which areas are completely frozen (thus potentially trapping your ship in the pack ice) makes things much more interesting. A judicious mix of luck and good timing is required to know when to leave your ship and head out on the sleds, and when to return to the ship and hightail it back to Greenland. Not to mention when to explore point-scoring sites and survey islands. 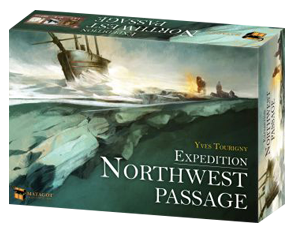 It’s a shame there is such an emphasis on Euro-like point scoring, because there was potential here for a more dramatic and immersive game, one highlighting the drama, sacrifice and, sometimes, horror of the trials of early arctic explorers. As it is, your immersion will probably depend on how much you can look beyond the tile-laying and point collection and build stories around the mechanics. In my first game, I did make a dramatic sled journey, and was forced to abandon my ship in the ice after a slight miscalculation; though I managed to get all my crew back to Greenland, the minor inconvenience of -2 ‘prestige points’ for losing my ship felt a bit like an anti-climax. Still, for Euro game fans looking for an attractive game with more theme than their usual fare, this is worth exploring. Both versions of the summary sheets look excellent! Thanks for taking the extra time to make the 2 different versions.